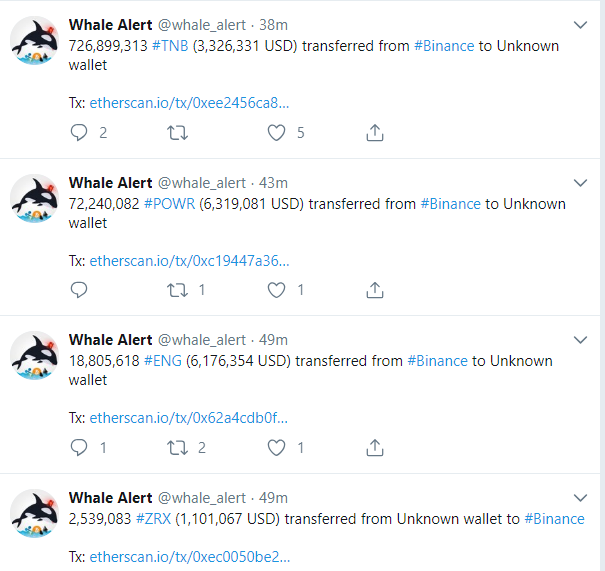 From the link, it can be seen that in the past 3 hours there have been multiple transfers of cryptos from Binance to unknown wallet, with amount ranged from $500,000 to over $512 million. The smallest was 177,855 EOS, which is around $551,295, while the largest was 98,776,172 BNB, which is approximately $ 512,314,962, all happened within the same hour. When a Twitter user confronted Binance’s CEO, Changpeng Zhao about the matter, he confirmed that all funds are SAFU by giving a link to his previous tweet that informed about Binance’s plan to move some funds between their cold wallets. Furthermore, he added that there’s nothing to worry about and no need to spread FUD, while also expecting that he won’t need to retweet his previous announcement for so many times.